Volunteer service group promoted suffrage, education, and other social, cultural causes. Founded 1902 one-half mi. SE. Clubwomen played an important role in shaping North Carolina life during the twentieth century. With the rise in interest in women’s history, that role increasingly has been recognized. Their influence extended to the ballot box, the workplace, public health, library development, the arts, conservation, and literacy. 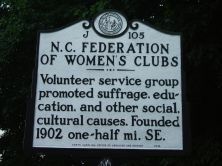 In 2002 the North Carolina Federation of Women’s Clubs (since 1998 known as the General Federation of Women’s Clubs of North Carolina, a name adopted to bring it into line with the national group name) marked its centennial. By Sallie Southall Cotten’s estimation, the group was first derided, then tolerated, and later acknowledged and respected. 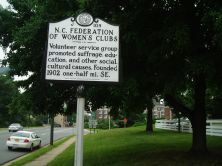 The organization bills itself at the “oldest, largest, charitable, non-denominational, nonpartisan service organization of volunteer women in North Carolina.” The original charter called for the “promotion of education and activities in civic, cultural, educational, and social welfare for the betterment of the commonwealth.” On May 26, 1902, the organizational meeting was held on the campus of Salem Academy (the name was changed to Salem Academy and College in 1907). Seven clubs were enrolled at the outset: Sorosis, Round Table, and Embroidery of Winston-Salem; Sorosis of Wilmington; Circulating Book Club of Salisbury; Goldsboro Women’s Club; and Alpha Club of Statesville. The original departments of work were education, library extension, village improvement, and state charities. The first president was Lucy Patterson of Winston-Salem. 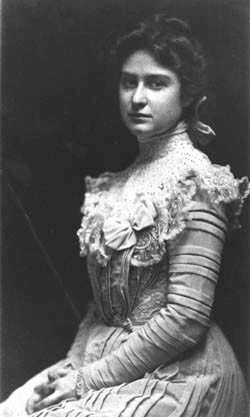 Gertrude Weil, 1901. Courtesy of NC Office of Archives & History.